This booklet is much better than most of the stuff of this kind that you see. The author is obviously making a nice passive income as he calls it by selling guidance books on how to escape the rat race, but he knows his stuff and gives good, solid advice. Right at the beginning, he offers another free book (I got this one free) which will put you on his mailing list. 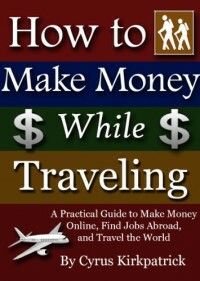 The book then proceeds to suggest ways of making money while traveling or as passive income, money that generates itself after a certain amount of start-up effort. The advice for overseas jobs goes in depth about what to actually expect from jobs like teaching English in foreign countries or being a contractor. Pitfalls are mapped out along with ideas about how to deal with legalities and what it's actually like to do these jobs, how much competition there is, and anything else that you really should know before quitting your 9-5 slave day job. Most people who read the book will probably never actually do much of what is suggested, but for the exceptions who are adventurous enough to travel the world and get by on the seat of their pants, you couldn't ask for a better guidebook. Be prepared for constant spam if you join the mailing list.